Continuing his adventurous journey around the world, filmmaker Rob Stewart brings us Revolution, a full-length feature film that is inspiring humanity to change the world and save our planet. Along with world renowned experts, he learns that past evolutions can help solve some of our current and future environmental problems. Startling, beautiful, and provocative, Revolution has already won awards at international film festivals and shows us that we can make a difference. Stewart met with renowned world experts who helped him find out about important issues affecting our lives. In an effort to uncover the secrets to a safer world, Stewart goes on an adventure filled with action and drama that will leave audiences around the world, at any age, inspired about how they can get involved in the fight to save our planet. Revolution is not just about the environment—it’s a film about hope and inspiration. It’s a call-to-action with an uplifting message that tells us it’s possible to alleviate the damage already done. It’s time for a Revolution! Rob Stewart is the filmmaker and environmental activist behind the movies Sharkwater (2006) and Revolution (2015). Since childhood, he has been passionate about the environment, especially the ocean. His love of nature drove him at first to pursue a career as a wildlife photojournalist and scuba diver. By the time he was in his early twenties, Stewart had already become an acclaimed photographer. That trajectory of Stewart’s life changed after he witnessed the practice of long-lining in supposedly protected marine areas in the Galapagos Islands. He put aside his already successful photography career to raise awareness about the threatened global shark population through documentary filmmaking. Sharkwater was completed in 2006 after several difficult years of filming, which included Stewart being hospitalized with flesh-eating disease and having run-ins with the “Shark Fin Mafia.” However, his experience did not deter him from continuing his work as an environmental activist and enthusiast—shortly after completing Sharkwater, Stewart began work on his next documentary film, Revolution, which expands the scope of his original film and focuses on numerous global environmental crises facing the human population. He continues to raise awareness by talking to people and supporting environmental protests and petitions around the globe. Rob Stewart is an award-winning filmmaker, actor, biologist, photographer and conservationist. His critically-acclaimed documentaries, Sharkwater (2006) and Revolution, have both won numerous awards and continue to help raise awareness about pressing environmental issues. 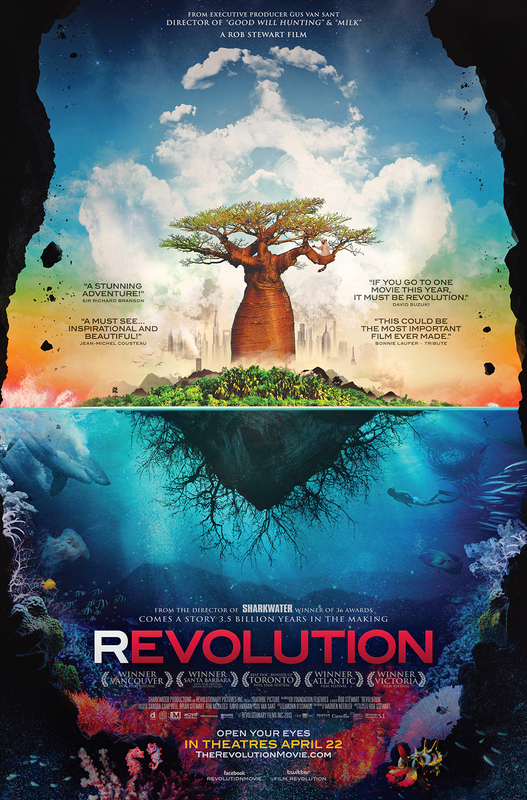 Revolution is a full length feature film that inspires change and brings up the topic of saving our planet’s ecosystems. He took an interest to underwater photography at a very young age and at 18-years-old, he was already a scuba instructor. He quickly went on to receive his Bachelor of Science degree in Biology, studying in Ontario, Jamaica and Kenya. The award-winning photographer began work on his first film after an assignment for the Canadian Wildlife Federation’s magazine. While photographing sharks in the Galapagos Islands, the horrible reality of illegal longlining and shark killing was brought to his attention. He knew he needed to raise awareness and at the age of 22, he quit his photography job and initiated a four-year journey through 12 countries. The result was his first major documentary, Sharkwater. The riveting documentary about his struggle to help save the sharks and a complex ecosystem was widely successful. After premiering at the Toronto International Film Festival and winning a “Canada’s Top Ten” award, Sharkwater went on to win over 36 awards at film festivals worldwide. Revolution is Stewart’s second film, the anticipated follow-up to Sharkwater. This time it took him on another four-year adventure across 15 countries. He discovers that not only are sharks in danger, but humanity itself. In an effort to save the planet and change the degrading path we’re on, Stewart researched past revolutions in order to inform viewers and help future generations. Stewart has also written two books, 2007’s Sharkwater: An Odyssey to Save the Planet and 2012’s Save the Humans. He is involved with numerous conservation groups including his own charity, United Conservationists, based in Los Angeles and Toronto.